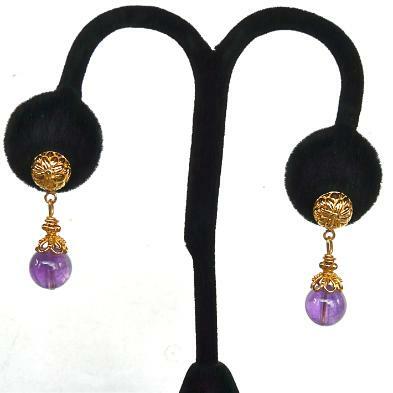 These amethyst drop earrings are a gorgeous clear purple. Amethyst is the birthstone for February and the zodiacal stone for Pisces. It is attractive to people who are caring and warm-natured and have a love of family and children. It is the suggested gem to give on the 4th, 6th and 17th wedding anniversaries. The Greeks believed that wearing amethyst would prevent intoxication. In medieval Europe soldiers wore amethyst amulets to protect them in battle. It is believed that putting an amethyst under your pillow will bring about pleasant dreams.